We had no business sticking around Radio City Music Hall. We were Hebrew school kids from Brooklyn, dragged by our teachers to see, on the big screen, The Little Prince, starring Richard Kiley, Bob Fosse, and other theater legends who meant nothing to us. Right after the fitfully entertaining movie, however, the whispering began. Our betters had decided that bringing us, in our formative years, to Radio City and not letting us witness its legendary live show, would be akin to serving a death-row inmate chicken wings but zapping him before the prime rib. And so there we were, ten-year-old Talmudists, suddenly witnessing glitz, glamour, wooden soldiers, Christmas trees, and the birth of Jesus. Disoriented but dazzled, we knew we had witnessed not only a piece of living New York history but a show as grand as any on Broadway or, possibly, in the world. 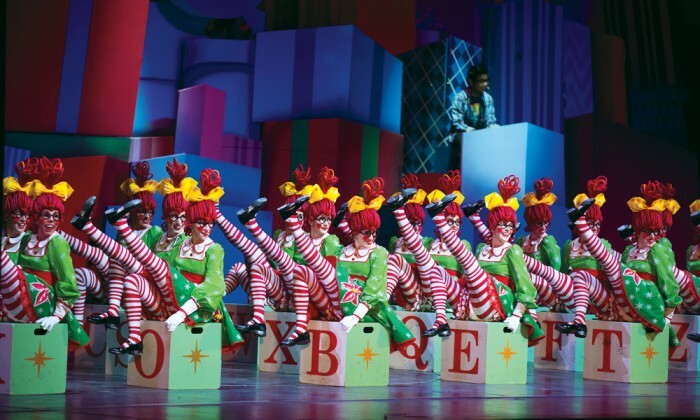 Since its launch in 1932, the Christmas Spectacular has been as much a part of Manhattan’s holiday season as the Herald Square windows and the Rockefeller Center tree. Who can argue with 84 years of success? Though I must admit, the ten-year-old in me still pines for just one little Chanukah number. Maybe next year. A part-time English professor at the University of Northern Colorado, David Lefkowitz hosts Dave’s Gone By (davesgoneby.com), co-publishes Performing Arts Insider, and founded TotalTheater.com. His one-act comedy, Blind Date, recently played in Chennai, India.